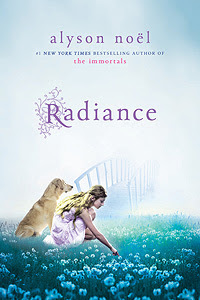 Radiance was written by Alyson Noel. It is the first book in the Riley Bloom Series. When I saw this book pop up in my suggested reading I was really excited to see another series by Alyson Noel. I read The Immortals series early in the year and really loved it. I was even MORE excited when I saw it was a series where Riley Bloom was the main character. If you pop over to my review of the The Immortals first book, Evermore, you'll actually see that Riley was my favorite character in that series. Again... love Riley Bloom. The book did not disappoint on making me love her even more. I want to point out that this series is a "middle grade series". Riley Bloom is "12" (or... "stuck" at 12 since it's when she died). While I definitely found it to be a quick, easy, fun read... it had no trouble keeping my interest. I really enjoyed the whole concept of having to "work" in the afterlife. Riley being assigned the job of Soul Catcher made total sense for her character... and I loved Bodhi. I'm trying to figure him out right along with Riley.